Everybody seems to be posting about the New Year, so I’m going to start this post off, although I may be a little late, by saying..HAPPY NEW YEAR!! I hope everybody enjoyed their celebrations!! So, it’s now 2014 and everybody (in the social media world) will be wondering how social media is going to develop this year; will it go in the same direction as 2013 and just get more and more popular? Most people would (stereotypically) associate ‘social media’ with teenagers, however it would seem that Facebook has seen a drop in usage from teenagers, although this hasn’t affected how much adults use Facebook as it has become more popular amongst adults. These numbers show an increase in different social media usage, however Pinterest has made the biggest leap…up by 6%!!! Which, in all honesty, surprises me because I wouldn’t (sorry if you’re an adult and do use Pinterest) expect many adults to use Pinterest; as I just can’t get to grips with it and its overall purpose…it isn’t a social media platform which I have ever been ‘bothered’ about or have ever used on a regular basis, unlike social media sites such as Twitter! 63% of users on Facebook sign in once per day; however it is said that 40% of those sign in multiple times throughout the day. This percentage of sign on per day for Facebook is higher than the likes of Twitter; where 46% of users log on daily and Instagram; where even more users than Twitter log on daily, as 57% of Instagram users sign in daily. Which sites do you log into daily, and do you log in to them more than once per day? Let me know your favourite social media sites in the comments. When creating your blog, whether you want it to be a money maker or just a place to express yourself, making your blog a published piece of writing that has the reach it deserves can be influenced by yourself. 1) Keep an online active presence – make sure you are updating you blog as often as possible or simply replying to any comments whenever you have the available time. 2) Share Share Share – use the other social platforms available to you, post your blog links on those platforms making the blog post more view-able. 3) Plan your content – Don’t expect to be able to just make up good quality content. Know what you’re going to post in advance. There are six things every blogger can do themselves — from titles to tags, for better blogging SEO.You canincrease blog traffic organically without paying a dime or taking any additional time. Once you understand it, just like grammar and punctuation, writing with SEO in mind becomes second nature. To be sure, there is more to SEO than just the six things I list here, but implementing these six blogging tricks into your every day posts will create a noticeable difference that you can measure. Choosing a great headline or title for your post used to simply be about coming up with something relevant yet catchy. While it is still important to have an attention grabbing headline, it is also true that when it comes to SEO your title matters. Want to know how to reach the top of Google’s Search Engine Optimisation rank system? Well you could search Google for hints and tips, which would mean changing everything you’ve already done. However, there is another option; you could watch the following video’s and subscribe to the channel for the best ways to boost your Google SEO. How to get to page one of Google & QUICKLY! What matters when considering the Google SEO ranking? -Title; keywords don’t necessarily matter. Make your title short and relevant to your post. -Clicks; the more clicks you get the higher you’ll rank. -Bold. Make a keyword bold, highlighted, this will make your post more visible! -Make sure the keywords you’re aiming for are the first/second word in your blog/website title. -Blog about your link; make yourself more visible. Want to know what businesses use to increase their Google SEO? Check this YouTube video for more info. What are the 10 Secret Benefits of Blogging? Just the discipline of sitting down and writing will improve your writing skills. Thinking and planning doesn’t cut it…action and doing does! What are the 10 Secret Benefits of Blogging?. I have been asked by a small retail and catering business- Crème de La Catering -to write a recommendation for a suitable blogging platform which will allow them to publicise their company. They’re looking to share recipes and tips on running good events; they also want to feature their suppliers so people know where their products are from. 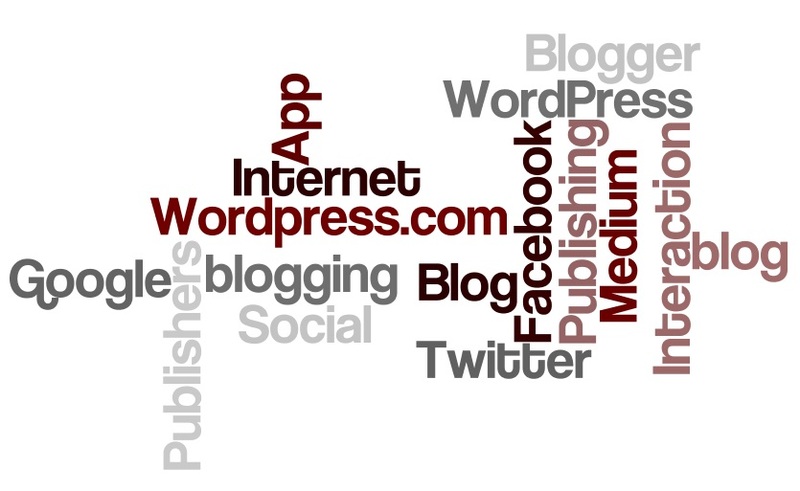 There are many blogging platforms available on the internet, for example; Blogger, WordPress, Tumblr, Ghost and a more recent blogging platform Medium. I will be discussing 2-3 of these and then discussing the final, chosen blogging platform, which I will recommend to Crème de La Catering in more depth. Blogger is a blog hosted platform which gives the option for its user to create an account for free. Blogger allows its users to design their own blog; you can choose from templates which have layouts and backgrounds which can easily be altered to make your blog appear unique. As well as this Blogger also allows its users to create a custom domain which would allow businesses, such as Crème de La Catering, to be found and followed easier. As Blogger is owned by Google it allows you to “connect seamlessly with Google+ , helping you reach new readers and participate in conversations your posts inspire” (Blogger, 2013) meaning if you share your posts you will create conversation about the topic of your post. This is a positive for a small business as creating conversation about your businesses helps to expand your audience reach. Although Blogger seems like a very good blogging platform I don’t think it would be suitable for Crème de La Catering as it seems like a very visual blogging platform, so may not be suitable for posts with a lot of text. However, this would be a good platform for posting pictures of Crème de La Catering’s products, food etc. Tumblr is a micro-blogging platform which is a very visual platform used, predominantly, by teenagers to post and reblog their friends and people they follow. Although you are able to share your posts on other social media sites such as Twitter, Facebook etc. I don’t think Tumblr would be suitable for a business to use. I believe this because the people who use Tumblr are, mostly, teenagers and as Crème de La Catering don’t specifically target teenagers, but a much wider audience, I don’t think Tumblr would be suitable for this small business is to use as their blogging platform. What is WordPress? “WordPress is a content management system. It’s basically a platform that…makes it insanely simple to create websites” (Wolfe, M 2012). WordPress.com and WordPress.org; what are the differences? Well, WordPress.org is “the self-hosted version of the platform” (Wolfe, M 2012) which allows you to host and own your own account; it isn’t hosted on the WordPress server so you have to pay for it. On the other hand WordPress.com “is hosted on WordPress’s servers” (Wolfe, M 2012) meaning that your account is not only free to setup but it is also free to use! WordPress, like Blogger, allows you to choose custom themes, which can be customised and widgets can be added to make your blog unique and do what you want it to. ‘Widget’ stands for ‘web gadgets’ and help to improve the look and functionality of your sidebar. For example, you can add RSS feeds and Twitter feeds; as well as being able to link your blog to other social media sites, i.e. Facebook and Instagram. There are many widgets available, however not all themes have the same widgets, so you may have to sacrifice a beautiful theme if it doesn’t have the widgets suitable for the purpose you intend. Businesses, in particular small businesses, should blog because it helps your Search Engine Optimisation (SEO); as Google displays the most recent content, therefore if your content is the most recent then you’ll be most searchable. WordPress takes “care of 80-90% of the mechanics of search engine optimisation for you” (WordPress, 2013). This is so that you don’t have to worry about posts being invisible on Google; if they’re up to date and your blog is updated regularly your post/blog will become even more visible in a Google search. Also, as WordPress takes care of the majority of SEO then you don’t have to spend as much time marketing your business online; it allows you to spend more time within the business while it’s being marketed for you. If you would like further help with searchability there are plugins available on WordPress. Searchability is vital, especially for a small business like Crème de La Catering, as it helps the businesses online presence grow and, therefore the people who buy products will grow. There are many ways which SEO can be improved without installing plugins, for example using; keywords, tags, categories, linking back to yourself, search friendly URLs and fresh, original, up to date content! Keywords are useful because they help your blog and its content to be more searchable. For example, if Crème de La Catering wanted to post a recipe on their blog it would be vital to use keywords which relate to the type of recipe. Say the recipe was a cheesecake recipe keywords used would be “cheesecake” and “recipe” as this clearly states what the post is about, also it will help the business’ SEO because if these terms were Googled then this article would appear. This is easy to do on WordPress as you just decide on a title, or phrase, which is popular on Google and this can be used as the title as WordPress will make it visible in Google. Tags and categories should always be used in every WordPress blog post; as “categories and tags offer an opportunity to increase traffic to your site via search engines” (Ewer, T 2013). They also help to organise your blog so people who read your blog can, for example, click on the “recipe” category and know that they’ll be able to just look at all the recipes Crème de La Catering have published. This makes it easier for your readers to find what they want, thus, hopefully, making them want to come back to your blog as it’s easy to use and navigate around. However, don’t go overboard when categorising posts, as a post shouldn’t be in more than 2 categories. Tags are useful because they enable you to “refind sites…you just click on the list of tags displayed on your own page…and it shows you a list of all the sites you’ve given that tag” (Weinberger, D 2008). Both tags and categories are simple to create on WordPress. Categories can be created either in the main dashboard or whilst creating a post. Tags are added to the bottom of each post so that the tags are relevant to your post. Linking back to yourself is an important way to keep an internal link in your blog, it also helps to drive traffic to other posts in your archives. For example, if Crème de La Catering were to post a new recipe they could link to previous recipes they’d do; encouraging viewers to look around the blog and follow it. WordPress allows you to do this by linking text to an internal or external URL or by putting your own article in the ‘related articles’ section; both these way link internally to your blog creating more traffic to more of your blog posts. Search friendly URLs are important when creating a blog because it’s, for instance, it is easy to understand what ‘www.cremedelacatering.com/recipes’ would contain. However it isn’t easy to understand what ‘www.cremedelacatering/58302’ would contain. Therefore, to make your site easy to remember and easy to predict the content you must have appropriate custom URLs. When setting up your WordPress account it is vital to choose an appropriate name which reflects what your content will be. Content, yes it may be an obvious one but it’s where people fall down when it comes to SEO. Creating original, fresh and up to date content is key in an online world; as everybody expects to be able to find out the latest fast! Therefore, to make a blog post about last week’s news it wouldn’t be appropriate, because this has already been and gone. So, to create ‘good’ content which will (we hope) become popular it needs to be current! This would work to the advantage of Crème de La Catering because all of the information posted on their blog would be up to date and current; as businesses are always changing, developing and having new ideas. So, Crème de La Catering would be able to inform their readers of this and also share their recent recipes, products etc. with the people reading their blog. WordPress allows you to do all of the vital things which help towards a good blog post and also to good searchability. Therefore, I would recommend WordPress because it is versatile; you can add or remove plugins and widgets wherever you’d like, dependent on what the theme you’ve chosen allows you to do. However, most themes allow you to have most widgets and plugins which are available to improve the functionality of your blog. As well as this WordPress allows you to add additional pages to your blog. It is important to have an ‘about’ page which is additional to your blog post page, archive etc. so that your readers know what your blog is about; the about page can also be used to add links to your other social media sites, such as Twitter, Facebook etc. Taxonomy is the way in which data is organised, this would be used on Crème de La Catering’s blog by either using ‘sitemaps’ or categories; which are the most common way of organising your blog posts. “In classification systems, an overstuffed miscellaneous category can be a sign that the system isn’t using all the relevant information” (Weinberger, D 2008), meaning if you “overstuff” a category it isn’t using it to its full advantage; therefore to use a category correctly you must be specific about what you want in your categories so that you don’t ‘overstuff’ them. Folksonomies would also be used to help the SEO of Crème de La Catering’s blog by using tags as explained earlier. In conclusion I wouldn’t recommend Blogger and Tumblr to be used by a small business because they are too visual and aren’t versatile enough. However, I would recommend WordPress because it is a very versatile blogging platform which allows the use of taxonomies and folksonomies; not only on the blog but on individual blog posts. As well as this WordPress can be customised and widgets and plugins can be added to make the blog function as you need it to, in order to suit the needs of your business. Overall, WordPress is a blog which allows you to do pretty much anything, although you have to pay for some themes, plugins etc. it isn’t impossible to create a very good, popular blog with a free WordPress blog; as it is (I would say) just as good as the version of WordPress you pay for. What are some of the Retweet surprises? Some of these are significant. 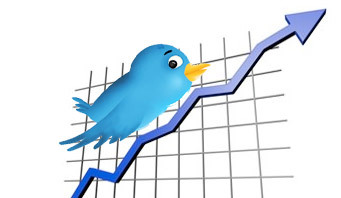 If you are into optimizing your Twitter tactics then maybe its worth taking notes. It comes down to time versus effort. Here are 9 ways to get more retweets on Twitter that you may want to weave into your social media marketing habits..
9 Simple and Powerful Ways to Get More Retweets on Twitter: Report – Jeffbullas’s Blog. Ever wondered how much of an impact your Twitter account is making? Well there’s no need to wonder any longer because these 3 tools will help you keep track of your Twitter accounts growth..
3 Twitter Tools To Help You Track Your Twitter Growth – Business 2 Community. Right, so as part of my research for my course assessment I thought ‘hey, why not research business marketing’. Why? To get an idea of what businesses like; i.e. how they like to market their business, what they market their business on (i.e. Twitter, Facebook, Blogs) etc. I know my brief is to ‘recommend a blogging platform’, but in order to be able to recommend a blogging platform I feel like I need to get to grips with the kind of marketing which is popular within business. First and foremost get people talking about your business, be it by word of mouth, via. sharing on Twitter etc. just get your businesses name ‘out there’ (online). Nobody will talk about a business which ‘fits the mould’; which is seen as a stereotypical “boring business”..make sure you do something unique, something which will be remembered THIS will get people sharing. THIS will get people talking. Don’t ‘drown’ people with information – yes information can be good, BUT if you’re not making sense of ‘tech-talk’ or just generally going off on one this is NOT a good for content marketing. In order to enable good content marketing for your business make sure YOU are the one who makes sense of the information which everybody is confused about. For example, there are millions and millions of webpages on Google, most of which are duplicates (and similar texts edited, changed and put into a different formats/layouts). However, if you’re the one making sense out of all this information your content is more likely to be viewed over the other webpages – insight is more important than heaps of information nobody understands. People choose their content more now than they ever have, so you’ve got to put yourself in their ‘path’, make sure your visible and somebody who’s looking for content similar to yours can find your content easily. So, if your content is visible make sure it’s reliable – you need your content, business etc. to stay trustworthy. As you already know ‘word of mouth’ spreads like wildfire, if your company can’t be trusted or isn’t seen as reliable someone could potentially tweet negativity about your business and so discourage others. These top marketing tips I have explained, inspired by “All You Really Need To Know About Marketing” show that sharing is a vital piece of marketing; as ‘word of mouth’ (well social media) seems to be much more valuable, from personal experience I can also say this, than advertisements and such. What marketing tips do you use for your business, blog, social media accounts etc? Any other top tips are welcomed, please share! Want to manage your social media accounts? Well there are plenty of social media management tools (sometimes referred to as ‘dashboards’) out there to use, such as; shoutlet, direct message lab, hootsuite, tweetdeck, wildfire interactive, strongmail social studio and many more. Social media management tools allow you to manage an element of one social media (i.e Twitter) or multiple social media websites at once (i.e. managing your Twitter posts & Facebook status’). I am going to discuss some social media management tools/dashboards which may help you to market your social media accounts better and boost your online presence. 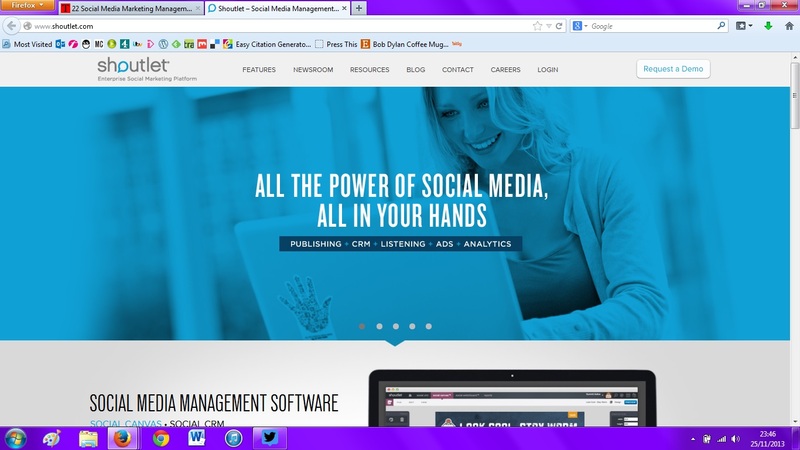 Shoutlet – a social media management software which helps you engage, promote and analyse your social communication. This software allows you to do this on various social media platforms, such as; Facebook, Twitter, LinkedIn and YouTube. 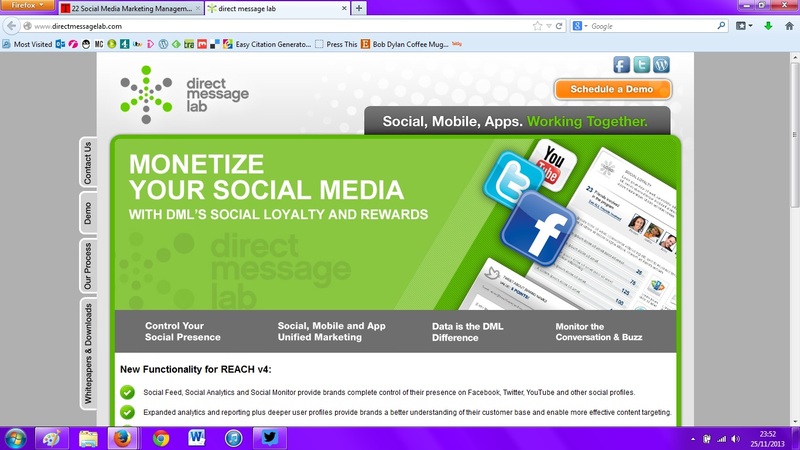 Direct Message Lab – Allows you to control your social presence. Direct Message Lab (DML) identifies key social media locations for your brand, for example; demographics, and finds users to reach in these ‘locations’. 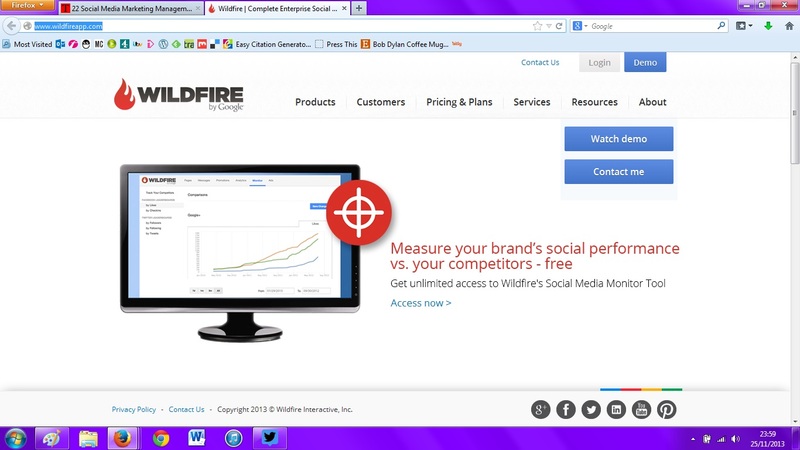 Wildfire Interactive – It’s a social media marketing software which engages in real time (like all social media). Also, wildfire allows you to schedule; so your social media accounts and networks are kept up to date. 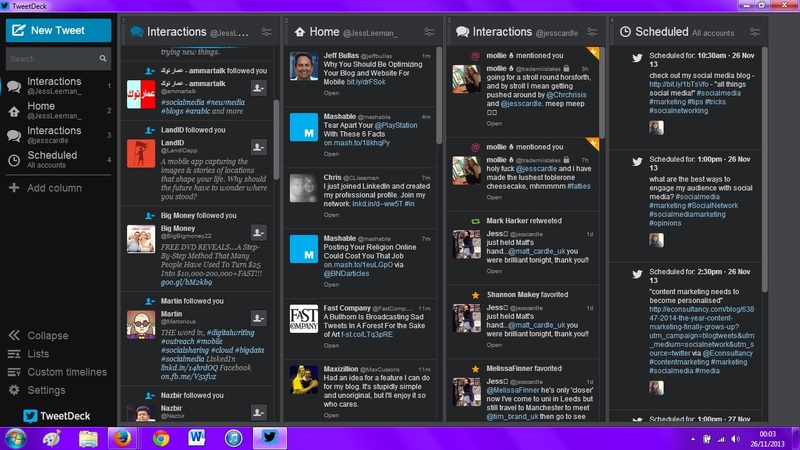 Tweetdeck – Is a social media dashboard which is available on Chrome, Mac, OS X, Microsoft Windows and mobile devices etc. You can use this dashboard to manage your Twitter account/s and schedule tweets for any time of day. This will make sure you stay active even if you’re too busy to tweet, as you’ve already scheduled a post. Do you use any social media management tools/dashboards?